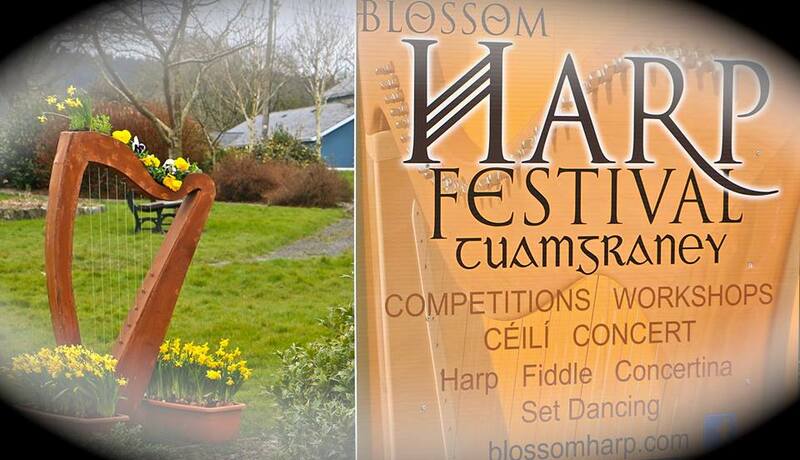 It’s that time of year again and here in Tuamgraney we are eagerly awaiting this year’s renewal of the Blossom Harp Festival. It began in 2016 and takes place on Palm Sunday Weekend each year. This is the 4th annual Festival and is on from the 12th-14th of April 2019. Its an enjoyable weekend of music and dance for all the family with Harp, Fiddle, Concertina & Set Dancing Workshops, Harp-Makers Exhibiton, Sessions, Concert, Ceilí & Musical Historical Walk. Local, National and International musicians will attend and it again promises to be a Weekend to remember in Tuamgraney. Check out a full list of festival events on Blossom Harp Festival Facebook Page. Brochures also now available. We look forward to welcoming everyone to Tuamgraney.!!! Why not take a Guided Festival Tour of East Clare during your stay with us. Famine Graveyard-Mass Rock-St Cronans 10thC Church-Famine Quay-Views of Lough Derg. Pickup Point : Tuamgraney NS. Drop Off Point : St Cronan’s Church. Depart : 11am. Return 2/3pm. Contact Derek at 087 2704380 for all details. Join us here at Clareville House and enjoy the fun. Contact Teresa at 061 922925 for availability etc.